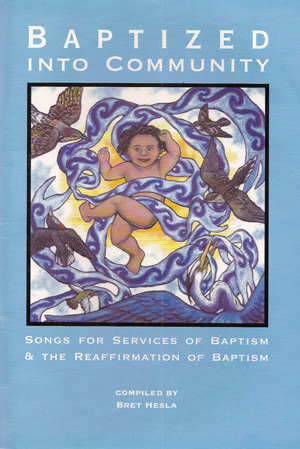 (Songbook–2000) Baptized into Community. Songbook with 26 songs for services of baptism and the reaffirmation of baptism. Composers include Bret Hesla, Ray Makeever, Larry Dittberner, Mary Preus, and Linda Breitag. Welcome those new folks (young or old) into your community with songs and rituals that involve everyone. Here are 26 great songs and ten dynamic ritual ideas compiled by Bret Hesla. Songs by various Minnesota composers. Some great ritual ideas from Dan Erlander. With melody lines, guitar chords, background notes, performance ideas. (Hard copy only: price includes shipping).